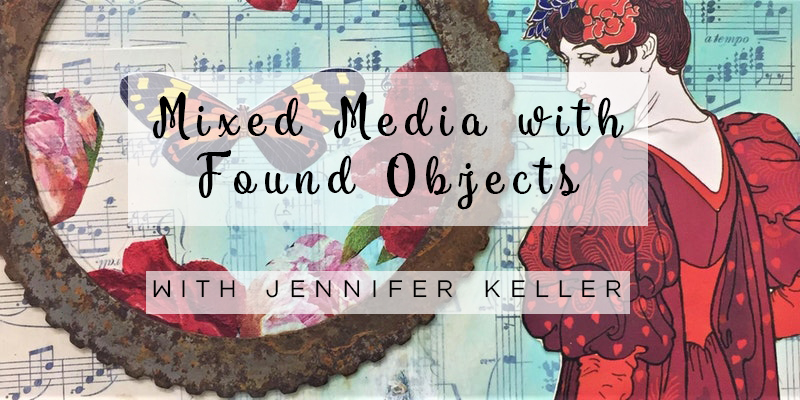 Explore the mystery of found objects, fabric, and paper collage. By combining different discarded materials in a creative way you have the ability to give old, interesting objects a magical new life. The Dos and Don'ts of selecting materials so your pieces don't fall apart. Interesting background techniques to support your composition. How to design a balanced piece that doesn't appear too busy or distracting. How to use the right adhesives to create strong bonds without any harsh fumes. How to have more control over the color in your piece using acrylic paint. Tricks for creating texture and adding depth so your work doesn't appear flat. How to work with different weights of paper, fabric, and even found objects. How to tie things together so your work appears more seamless. How you can bring in personal touches to make your art your own. This class is fun for all experience levels. Perhaps you've been craving creativity but you don't have any advanced drawing or painting skills. Or maybe you can draw and paint, but want to learn more techniques for loosening up. The thought of handling beautiful papers and fabrics all day sends you into a state of bliss. You want to let go of strict art rules and use pre-printed papers and fabrics with the images already on them. You like the idea of feeling youthful while playing with glue, scissors, and paint. You love the look of repurposed art. You've been saving all sorts of cards and pretty papers but they're just taking up space. Most of the materials in this class will be provided by Jennifer, including fabric and paper scraps, acrylic paint, small found objects, paint rags, pallets, acrylic matte medium, acrylic regular gel and canvas panels. Scissors and optional xacto knife. Extra paper scraps that resonate with you personally. Examples include postcards, greeting cards, pages from books (written or pictures), gift wrap, magazine cut-outs, receipts, journal pages, to-do lists, packaging cut-outs, stamps, tags, decorative/handmade art papers, scrapbooking supplies. Fabric scraps (optional) - Light to medium weight fabrics work. No heavier than canvas. A variety of sizes of prints is nice. Stretchy or really fuzzy fabrics do not work. Bonus points for embroidery. Found objects that have a flat back. Drinking water bottle and brown bag lunch or lunch money for one of the many restaurants in the area. We will take a 45 minute break.